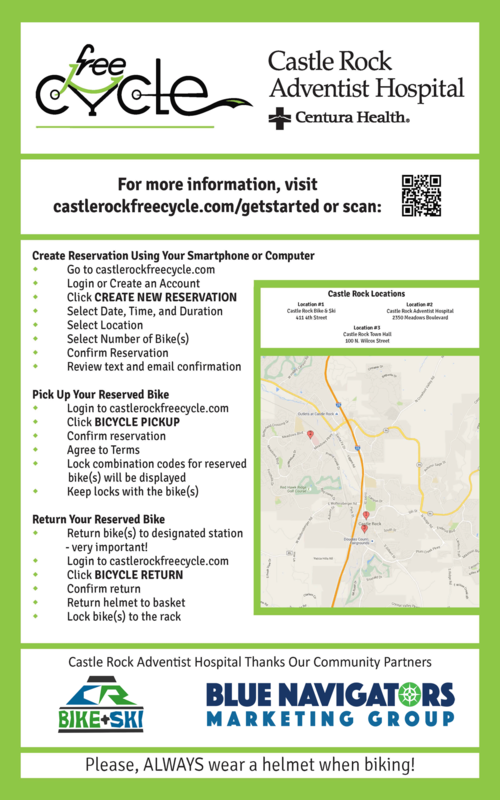 Welcome to FreeCycle, Castle Rock’s FREE community bicycle program! Castle Rock Adventist Hospital in community partnership with Blue Navigators Marketing Group are encouraging health and wellness in our town by providing Castle Rock residents and visitors the ability to check out and ride those green bikes any day of the week! At the Castle Rock Adventist Health Campus, 2350 Meadows Blvd. Anyone younger than 18 must have a parent’s consent before reserving a bike. If your bike has a broken or missing part, please call the Free Cycle help line at (720) 455-2538. If the bike you reserved is not in the rack at the start of your time, please call the Free Cycle help line at 720-455-2538. Can I rent a bike in one location and return it at another location? No. This season we are operating only out of the Castle Rock Adventist Hospital location. Please return your bike to the rack where you picked it up. Yes, always wear a helmet for safety – even if traveling a short distance! Helmets are included for with each rental. Contact the Free Cycle manager for more details. Please call FreeCycle at 720.455.2538!